Vang Vieng is a small tourist-oriented town about 150km north of Vientiane capital, located in Vientiane province, easily reached on highway 13. 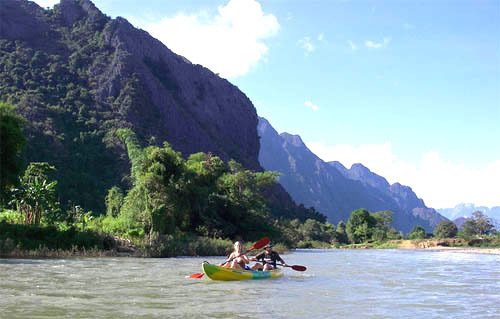 Located on the Nam Song (Song River also spelt Xong), Vang Vieng boasts a natural beauty. The town is surrounded by a picturesque backdrop of limestone karsts and is surrounded by farmland. While it offers much for all visitors, it is also a backpacker hotspot, so can become very crowded in the high (dry) season. If you want to go outside of the town, bicycles and motorbikes are widely available for rent. A day’s rental is around 10,000 kip for a bicycle and 30,000 kip for a motorbike. Renting from hotels or guesthouses is more expensive. So… what makes Vang Vieng special? Its stunning natural surroundings, the karst landscape, the Song river, caves and cliffs make Vang Vieng interesting and popular among visitors. These have always been the main attractions that draw visitors to this tiny town. The caves and the cliffs here are great for rock-climbing activities, and there are rock walls to suit every level (from beginner to pros). The area has earned a reputation for one of the best for rock-climbing in the southeast Asian region. Vang Vieng’s famous tubing and the town’s party atmosphere have got it talked about around the world. It is known as a party town amongst younger travellers and backpackers. What kind of things can you do and see in Vang Vieng Laos? There are plenty of activities in Vang Vieng including kayaking, tubing, rope swinging and playing rattan ball and volleyball games in mud pits. There are hill and cave treks. 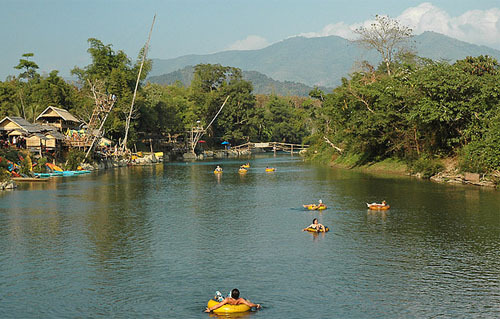 The Song River is the centre for most of the activities. If this sounds a little too adventurous for you, don’t worry. There are more relaxing and non-adventurous activities too. There are numerous natural caves in Vang Vieng waiting to be explored. They can easily be reached either on foot, by bicycle or by motorbike. The nearest one, Jang cave, is just across the Song River. Some of the caves offer natural pools for swimming. Speaking of swimming, the Song River is one of the best places to swim in. It’s our favourite, well… it’s mine and my son’s favourite. I’d recommend for those travelling with kids. The river is calm, its water is crystal clear and the low water level makes it just right for swimming (most months of the year). However, I would not recommend swimming there in rainy season, around June-September, the water is muddy and the current is too rapid when the water level is higher. Taking a ride on a long-tail boat, go up the river and down, before sunset is a good way to enjoy your afternoon. You will get closer to nature and see magnificent views unfold in front of you with little or no effort on your part. Sit back, relax and enjoy the cool breeze, breathe in as much fresh air as you can while enjoying the view of sheer cliffs rising directly beside the river. This is also a good opportunity to observe local ways of life along the river. If you want to escape the tourist crowd, hire a motorbike or a bicycle and ride through quiet countryside, passing villages and observing ways of life that remain largely unchanged for many years. Once you are out of town don’t forget to visit a laid-back organic farm around 4 km north of Vang Vieng town. The farm is open to visitors. You can learn about the production of silk, poultry rearing and the making of goat cheese. They have a restaurant that serves organic food and some other goodies such as mulberry pancakes, the signature mulberry shake and home made goat cheese. And if you want to stay the night, they have rooms for rent ranging from dormitory (30,000 kip per night) to more luxurious with a king size bed, private bath, and fan (150,000 kip per night). The farm offers volunteering opportunities including teaching English to village kids and farming, such as planting or harvests the fruit and vegetables that are grown here especially the mulberries for which the farm is famous. Vang Vieng is accessible by land from the main tourist towns of Vientiane, Luang Prabang, Xiengkhuang, Udon Thani and Nong Khai (Thailand) via Vientiane. No direct air service available (no airport in Vang Vieng). A direct bus service between Vang Vieng and Udon Thani, Thailand has recently been established. 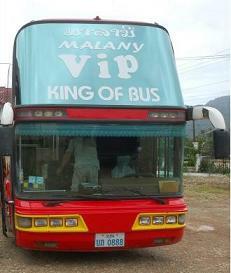 Malany, a Lao bus company, and a Thai bus company join hands to provide the service. At present there is one bus daily. The bus departs from Udon Thani bus station (near Central Plaza) at 08:30am. It stops at Nong Khai bus station to pick up passengers and resume the journey around 9:40am. Then stops again at the border at both sides for immigration clearance. Passengers of this bus can get Lao visa on arrival without having to worry if the bus will leave you behind. The bus will wait however long the visa processing takes. The statement (in bold) above is no longer true. I've just checked the facts (22 September 2014) after receiving several reports that travellers, who need a Lao visa to enter the country, but not yet have one on their passport are not allowed to buy the bus ticket. The reports seem to be right. I checked with the ticketing officer at Nong Khai bus station, he firmly said that tickets will only be sold to passengers with the Lao visa already stamped/stuck on their passport (for those who need one to enter Laos). On the other hand, the bus company here in Laos still says passengers of their buses can obtain Lao visa on arrival at the Lao-Thai Friendship Bridge where the bus crosses to Laos and the bus waits till the process is done. A one-way ticket for Udon Thani - Vang Vieng costs 320Baht or 88,000Kip. For Nong Khai - Vang Vieng it costs 270Baht or 75,000kip. The journey from Udon Thani to Vang Vieng takes around 7-8 hours at present due to poor condition of the road between Vientiane and Vang Vieng. It normally takes around 6 hours. View Getting Out section for buses going to Nong Khai/Udon Thani. There are several buses and minivans running between Vientiane and Vang Vieng daily. They range from slow local buses with no air-conditioning to express comfortable air-conditioned buses. Local buses cost around 40,000kip. Stops to pick up/drop off passengers along the way are fairly frequent. VIP or tourist buses (air-conditioning, faster and limited stops) cost 50,000kip and express buses cost 60,000kip one way. The normal bus departs from the Morning Market bus station every hour. The first bus is at 07:00 and the last one is at 16:00 (buses to Kasi also stop to drop off passengers in Vang Vieng). You can board the bus either at the central bus station next to the Morning Market (slow buses) or the northern bus station. Tourist buses (run by Malany Company) depart from the city centre, or to be exact, from Santisouk restaurant opposite the National Cultural Hall. Another boarding point is by the Mekong River, on Fa Ngoum Road just opposite Wat Chanh temple. There are two buses daily, the first bus is at 10:00 and the last one departs at 14:00. For return buses please see Getting Out section. For inquiries, call (856-23) 511 633. Once in Vang Vieng, some buses drop passengers off at the old airstrip that looks like a giant parking lot next to the main road which can be confusing especially if it is your first time here. Just walk west and Vang Vieng town is just a block away. Minivans, the most convenient and comfortable transport, cost around 70,000 to 80,000 kip per person. Tickets for tourist buses and minivans to Vang Vieng can be purchased from most hotels and guesthouses or from travel agents in Vientiane. Transport to the bus station is usually included. You can also buy the tickets at the bus station prior to boarding, though buses do fill fast in peak season…so get there early to secure your seat. Wherever (in Vientiane) you start your journey, find your way to road No.13 North. If you are in Vientiane city or somewhere south of the city, just drive north on Luang Prabang road (the road to Wattay International Airport), that’s road No.13 North. From there, just follow the road and you are well on track. The distance between Vientiane and Vang Vieng is around 150km (93 miles), of which around half winds through hills. The narrow, two-lane highway is sealed and in quite good condition, although some parts are deteriorating due to a lot of rainfall in this last rainy season. Travelling time between Vientiane and Vang Vieng is around 3-5 hours by bus and a bit less by private cars or minivans. If you suffer motion sickness, it is wise to take necessary precautions especially when you go by bus, the motion can make travellers sick. There are many VIP, express buses, and minivans daily from Luang Prabang to Vang Vieng. 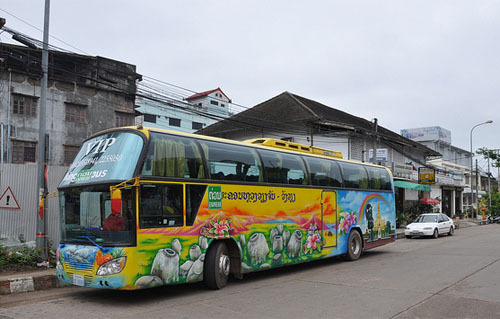 However, most VIP and express buses are Luang Prabang- Vientiane buses. That means you can board them and be dropped off in Vang Vieng, but pay the price for Vientiane. VIP (Luang Prabang – Vang Vieng): costs 105,000 kip departs 09:30 and 12:30. VIP (Luang Prabang – Vientiane): costs 130,000 kip, departs 8:00, 09:00, 19:30 and 20:00 (sleeper bus). The journey takes 6-7 hours to Vang Vieng and around 10 hours all the way to Vientiane. The VIP buses have more leg room and are more comfortable for a long journey. Express (Luang Prabang – Vientiane): costs 110,000kip, departs 06:30, 11:00, 14:00, 16:30, and 18:30. Note express buses are just normal air-conditioned buses. They are not any faster than the VIP. A tuk-tuk ride to Naluang bus station from the town centre costs around 20,000-30,000kip. Minivan (Luang Prabang – Vang Vieng): costs 100,000 kip, departs 09:00, 10:00, 14:00 and 16:00, it takes around 6-7 hours. Minivans have a separate station close to the VIP and express station in Ban Naluang. Phone (071) 212 979. Note: The prices and times of departure are provided as a guide, they are accurate as at February 2012, however, they may change without notice. These prices are direct purchase from the bus station, if you buy tickets through travel agents or hotels/guesthouses they are more expensive. Tickets can be bought at the bus station prior to boarding. You can also buy them at most travel agents, guesthouses and hotels (more expensive, but a transfer to the station is usually included). Tickets for minivans can also be bought at the minivan station prior to boarding (100,000kip). You can also buy them at most travel agents or hotels, pick-up is usually included. If you buy tickets directly from the bus company and request to be picked up at your hotel you will be charged a pick up fee of 5,000 kip (total 105,000 kip). For inquiries call the station at 071 212 979. There are four buses from Phonsavan to Vang Vieng daily, at 8:00am, 4:00pm, 6:00pm, and 8:30pm. The buses are 45-seat air-con. The 8:30pm one is a sleeper bus, costs 150,000kip, the other ones cost 110,000kip. For enquiry or seat booking call +856 20 5576 0231. There is also one minivan daily, departs at 09:00, costs 100,000kip. For enquiry call +856 30 517 0148. There are, close to a hundred places to stay in this tiny town ranging from low-key home-stay and guesthouses to boutique-style residences and hotels. 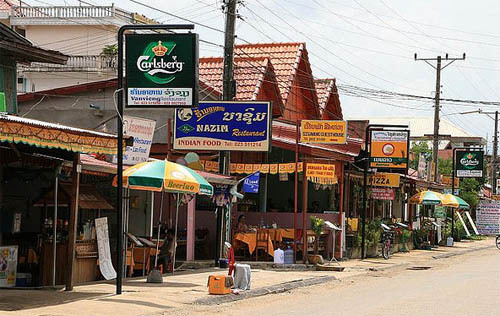 There are numerous restaurants along the main road offering a selection of Lao, Thai, Chinese, American, Italian and Indian food, though all of them have similar menus. The Organic farm Café – as the name suggests, offers organic food, original and interesting menus. Nazim - Serves great Indian food. Nisha Indian - Also serves great Indian food. Open from 2pm. If you’re into pizza, there are a few good pizza places such as DK3 – Milan Pizza (offers woodfired pizza) and Enjoy Restaurant. For those looking for a chilled-out atmosphere bar to have some drinks, Jaidee Bar, on the riverside, is a great place to escape the loud music. Good prices during Happy Hour (6-10). For those seeking for a more raucous time, there are many bars near the river playing loud music, some have DJs and an outdoor dance floor. A word of caution. The “special” shakes offered in many bars or “magic” food can contain ganja or magic mushrooms. These can be dangerous and should definitely be avoided if you are planning to go tubing, jumping or engaging in any other water sports. Several people have died in Vang Vieng in recent years because of stupid drunken or drug-related behaviour. Don’t become one of them. Also drugs are illegal in Laos. Buying or consuming them in public (eg smoking opium) can lead to arrests, heavy fines and passports being confiscated. Do not engage in any deals with anyone, many police work under cover and many restaurants are working in collusion with police. There is one bus daily departing fron Vang Vieng town at 9:30am. The bus makes three stops, one at each side of the border for immigration clearance and another one at Nong Khai bus station (around 10 minutes) to drop off or pick up passengers. A one-way ticket for Vang Vieng - Nong Khai costs 75,000kip, and Vang Vieng Udon Thani costs 88,000kip. Buses used for the route are 45-seated air-conditioned. You can be confident that your Vang Vieng - Udon Thani bus journey is comfortable. Tourist buses run by Malany Company depart 3 times daily (09:00, 10:00 and 13:30). Boarding is in front of the company office in Ban Savang. Tickets (50,000kip) can be purchased at the office before boarding. Minivans leave at 09:00 and cost 60,000kip. VIP buses leave at 10:00 and 13:00, cost 60,000kip. Minivans depart from Vang Vieng bus station at 09:00 and 14:00, costs 100,000kip. VIP buses leave at 10:00 and cost 90,000 kip. There are a few buses and minivans heading Phonsavan everyday. Departure time for buses is somewhat unclear at the moment, cost between 110,000kip and 150,000kip. Minivan departs at 09:00, cost 100,000. The journey takes 6-7 hours.